With packages to fit any budget and desire whether singing to backing tracks to a full live band. With almost 15 years of experience of highly entertaining performances. She is not just a singer but a highly versatile entertainer. And has also appeared at THE JAZZ CAFÉ, Madjeski Stadium, (READING), De ja Vu (now Monroes), Bridges, Caversham, plus many more! If you are Christian she can also offer a large range of Gospel songs. This versatile entertainer can tailor the music to the wedding. The most important part of any Wedding that Wayeta performs at is that it is memorably perfect for the bride and groom. How about having a live musician serenading you for background music whilst people are having the wedding breakfast or performing your first dance, tailoring it to the bride & groom. Whether you like Jazz, soul, funky or pop she can give that special day that extra bit of sparkle. 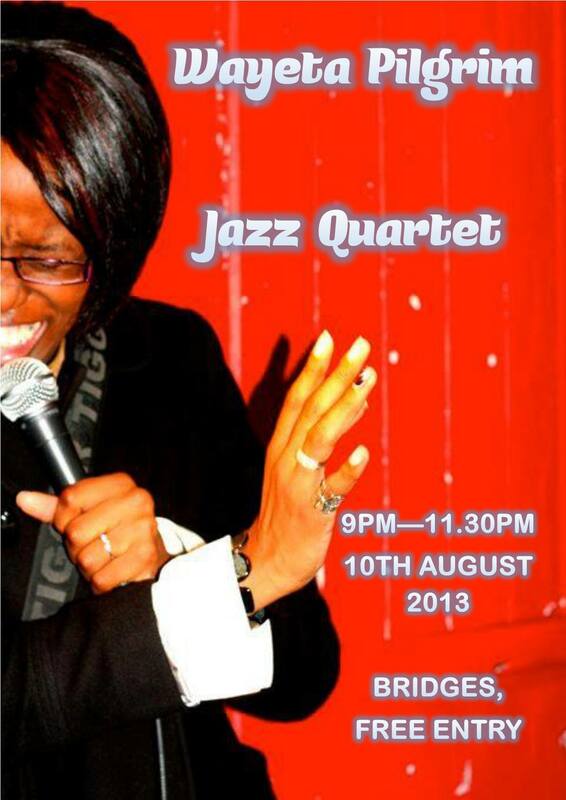 On10th August from 9.30pm Reading Jazz Singer, Wayeta Pilgrim will be performing with her Jazz Quartet at Bridges. In this Reading event the highly talented Quartet will be covering a wide range of Jazz. Wayeta is a highly regarded Jazz/soul/funky musician in the local area who has played in many places including Jazz cafe and Jazz club, De ja Vu, Global Cafe and more! She will be playing with a highly talented backing band lead by Jim Wade. If you like your jazz covers this is not to be missed. As well as being a highly talented singer Wayeta also has a great sense of humour creating a well rounded highly entertaining performer.